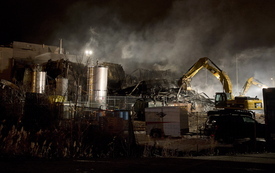 Investigators are still trying to understand what caused an explosion at an industrial plant in Sherbrooke, Que. on Thursday that killed two employees and seriously injured several others. Nineteen people were taken to hospital in the blast in the Eastern Townships town, including five with serious burns. Four burn victims were transferred to a Montreal hospital. Fire crews also pulled out a woman who was hiding and terrified but alive. It happened at a Neptune Technologies & Bioresources facility, which produces and exports health products derived from marine life, such as Omega-3 supplements. 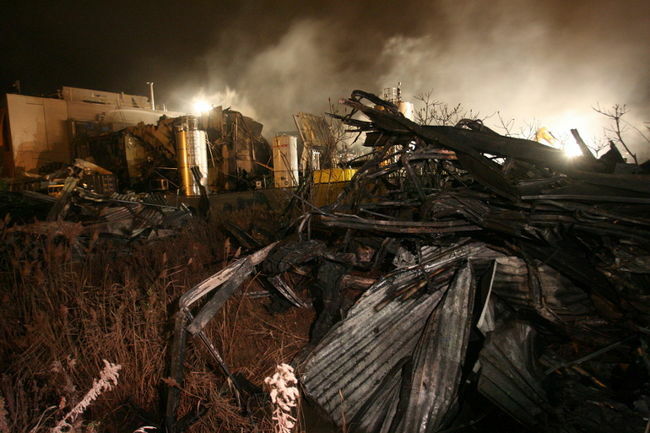 The explosion site Friday morning is being described as a scene of devastation. The only walls that remain standing have been scorched black by the fire that followed the explosions. Neptune confirms that the two who were killed were employees. It’s promising to co-operate with police during the investigation and has also brought in a psychiatric support team to help traumatized workers. "We're in terrible shock over what's happened," Michel Chartrand, chief of operations for the company, told reporters at a press conference Thursday evening. Witnesses say there was at least one large explosion followed by a series of smaller ones. The blast triggered a fire that sent thick dark smoke billowing in the air for several hours before a crew of 50 firefighters could get it under control. The fire was fuelled in part by 15,000 litres of acetone at the plant, which is a highly flammable substance. There were concerns about toxicity because acetone can cause irritation if ingested. But tests revealed the smoke did not contain toxic chemicals. As well, the wind kept the smoke away from residential areas. The initial blast was so violent, it was heard across the city and set a local record for 911 calls, according to local fire chief Gaetan Drouin. "Just looking at the damage to the building you can see it was probably very violent," Drouin said. Martin Carrier, a Sherbrooke police spokesman, said more than 100 people in Sherbrooke and surrounding suburbs phoned within a minute of the blast.